Sometimes, the government needs a villain. That's when they turn to Julia, leader of Project Redemption, a special organization that plucks super villains from jail and uses them in various covert activities. Project Redemption has not been tagged yet. 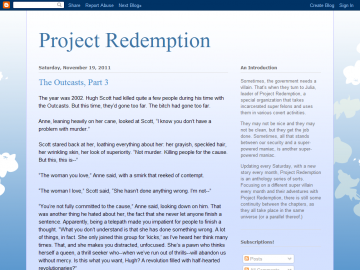 Help others find Project Redemption by tagging it! The writing on this is legible. That's about the only nice thing I can say. Project Redemption has not been recommended yet.